If ever a man was impelled by insatiable curiosity, it was John Lawson. His itch to know led him not just into the Carolinas but also into alien cultures and a natural world quite unlike the one to which he was born in England. The year of his birth was 1674; as he matured, he certainly received a stellar education in subjects ranging from divinity to the natural sciences. His immigration to the Carolinas took place in 1700, when he was a frisky twenty-six years old. The reason that he crossed the Atlantic to the New World was word from a “gentleman” friend, who had told him that the Carolinas were far and away the best part of America to visit. He set sail almost immediately and arrived first in New York, then at the port of Charles Town, modern Charleston, in the summer of 1700. Thence, he embarked with companions on a fifty-seven day trek that covered nearly 600 miles. They journeyed up the Santee River in a canoe large enough to hold six Englishmen, four Indians, and their equipment. They traveled up the Yadkin River valley and on, by shank’s mare, into present-day North Carolina. Their journey ended on the Pamlico River at the future site of Washington. All along the way, John Lawson recorded his observations in what became his rewnowned and oft-cited book, A New Voyage to Carolina. 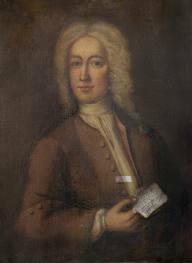 John Lawson, the very model of an eighteenth-century gentleman, was the first star in North Carolina’s literary firmament. Danny Bell, the Program Coordinator for the curriculum in American Indian Studies at the University of North Carolina at Chapel Hill, reads an excerpt from naturalist John Lawson’s book, A New Voyage to Carolina, at the 2012 NC Literary Hall of Fame inductions, Southern Pines, NC. Read Phillip Manning’s remarks on presenting John Lawson for induction into the North Carolina Literary Hall of Fame. Watch a recreation of John Lawson’s river expedition—punctuated by a fish stew.